If you have a blind dog, you have no other option to help their quality of life than getting a Muffin's Halo for your furbaby! Our dog Sasha went blind suddenly (the condition is called SARDS) and Muffin's Halo prevents her from smashing her skull into furniture constantly. The Muffin's Halo is like a bumper for her head, just giving her the slightest resistance to move her away from danger. It's an amazing product and I'd literally be in the funny farm if it weren't for Muffin's Halo. Do not accept imitators...this is the real deal, made with love by Silvie and her team. She is doing amazing work and I can't thank her enough for improving Sasha's golden years. Read the Muffin's Halo site and see what a labor of love this is. I've spoken to Silvie several times by phone and she is passionate, compassionate, and the most empathetic person I've ever "met." Thank you, Silvie and Muffin! searching on the internet for helmets for bind dogs and this is where I found Muffin’s Halo. We searched the website and realized this would be perfect for our Katie, so we emailed on how to get the correct size for her. Silvie herself called and explained to us what we needed to do to get Katie’s measurements. We gathered the measurements an emailed them to Silvie. We ordered Katie’s halo immediately and was kept up to date on the order status via email. Upon arrival of Muffin’s halo, we put it on Katie and she came to life!! It made me cry seeing her run around like she was. It was WONDERFUL to see her happy. I hadn’t seen her this confident in this last couple of years!! I was just told 2 months ago that my Bichon was blind. I was devastated, I told the vet to put him down and she talked me out of it. I just did not want him to live a life if he had no quality of life. I got home and instantly went to the internet wanting to learn everything I could about blind dogs. I saw the website for Muffins Halos. I felt very relived that all those dogs were being helped by the halo. I got one for Mickey and he is doing GREAT with it. Now I don't have to worry about him hitting his precious head on anything. He does not mind it at all. When I put it on he knows we are going out for a walk. We LOVE it, thank you very much for making such a wonderful item. I don't know what I would do without it!!!! My foster dog, Jul, just received her Muffin's Halo and it is such a blessing for her. Jul is a miniature poodle who is both blind and deaf. She has been moved around so many times that she must feel like she landed on another planet. She really has no idea where she is. It was breaking my heart to see her so lost and confused and just crashing into things, but she hates to be confined and got very upset when I put a soft cone on her to try and protect her head. Right from the start, she had no problem wearing the "halo". It fits her perfectly and is very light weight. Now I can smile when I see her walking around, instead of worrying that she will hurt herself. She also looks so cute in it! I can't thank Silvie and Muffin enough for helping to make the quality of life so much better for sweet Jul. I must agree with the other reviews - a Muffin's Halo is simply a must-have for any blind dog. I recently adopted a blind dog who is also deaf - so I couldn't even warn her before she would bump her little head! She also does not do very well on a leash. I had joked with my family that she really needed a little helmet to protect her head - and, low and behold, I stumbled upon Muffin's Halo. The Muffin's Halo has helped her learn her way around my home and the back yard without hurting herself. Now, anytime I take her somewhere new, I put her halo on and she can explore without fear of getting hurt! It's easy to assemble, put on and take with me. This product is amazing for dogs with vision problems. I volunteer with a rescue that helps many special needs dogs and one of my fosters, Popeye, a Shi Tzu mix, was diagnosed with permanent vision loss because he was neglected by his previous owners. Popeye did not do well on the leash and had a difficult time moving around, because he was afraid of bumping into things and there was an incident when he ran into a wall in our house, during a thunderstorm because he was so scared of the noises outside. He has had Muffin's Halo for almost a month now and since then he has become more active and adventurous at my house and at the adoption events. Muffin's Halo has helped him gain more confidence and he has become more affectionate with me and new people. Volunteers also have noticed he is more active prior to him using Muffin's Halo and it is because of this product, I truly believe that he will get adopted because it has helped him emotionally and physically. Maltese Max was surrendered by a homeless person. When I rescued him, he had one eye twice the size of the other eye. We ended up discovering he had painful glaucoma and had to have both eyes removed, however was left with one prosthetic eye. I was told by several people about Muffin's Halo and decided to try it out. I was shocked with how quickly Max adapted to it. I mean you could just literally see how suddenly his head came up and it was like he bumped into things like he normally did , but it wasn't his nose bumping into it, it was his shield. He had like special wings. I actually filmed the moment when he first got it. The images of that speak louder than any words that I could come up with. It's very easy, because when you decide to take the wings off, they're attached by velcro, and he's wearing a little harness that the wings are attached to which he would be wearing anyway to be walked. I would recommend it because it gives the dog a sense of freedom. It gives them their little blind dog super powers. It builds their confidence. It allows them to explore a new space, without actually bumping head on into objects. It makes him feel safer. This was so absolutely amazing! We have no idea how to thank you! GG is high stepping with the other dogs and it only took minutes for her to get used to it. Thank you so much for making our precious girl's life better! Muffin's Halo has helped Hannah navigate her new surroundings and gave her a lot of confidence. We love her so much and people like you make our adjustment and Hannah's much easier. Thank you again. I love the Muffin's Halo. Dustie is familiar with it. She walks faster with it on. When I take it off I have to remember to stay close to her because she still wants to walk as fast as she did with it on. I think it provides her with more confidence and security. Thank you so very much for coming up with such a great product. 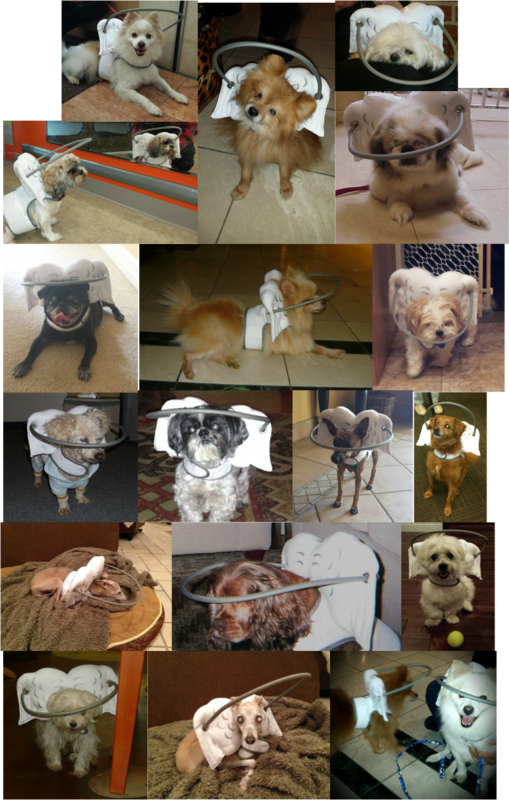 Muffin's Halo is an amazing product for blind and visually impaired dogs. I am a professional photographer who also happens to run an animal rescue too. The inventor of Muffin's Halo, Silvie Bordeaux contacted me to shoot photos of the product for her website. I met Muffin during the photoshoot. He is a completely blind dog and Silvie's inspiration to invent Muffin's Halo. Muffin walked confidently and safely around his home. The halo gently would direct Muffin to maneuver himself around when he would walk into walls and furniture while his Halo protected his eyes, face and head from injury. I was so impressed with this product that I instantly became a fan! If you have a pet or know of someone who has a pet who is is losing their freedom due to losing their eye sight or other vision issues, I fully recommend checking out Muffin's Halo to help your pet live better and safer.